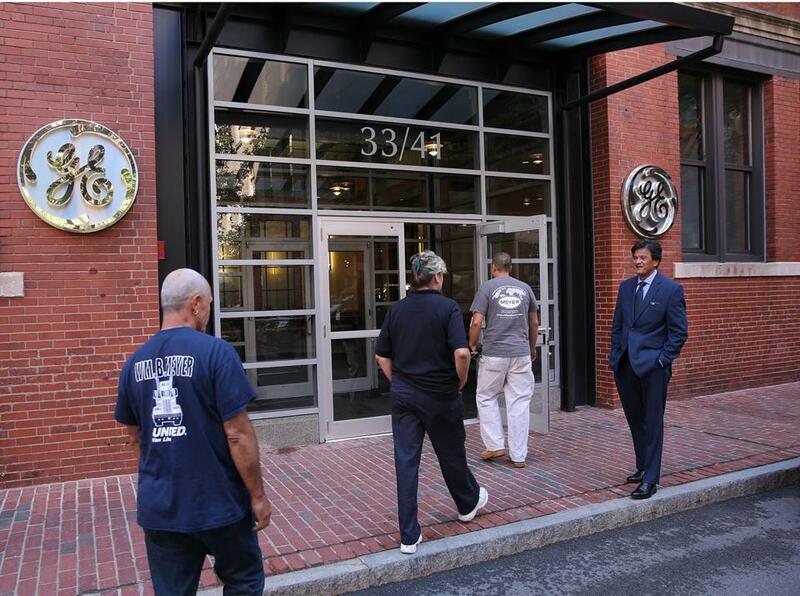 General Electric in August moved its headquarters into a temporary space on Farnsworth Street in Boston. General Electric Co., it turns out, had one more deal to make before it could start building a new headquarters in South Boston’s Fort Point section. Company officials said GE spent $1.5 million this month to secure a 6,800-square-foot parcel along the Fort Point Channel from Gillette’s parent company, Procter & Gamble, bringing the size of GE’s campus to 2.7 acres. GE needs least at least half of its campus to be considered open space to obtain a state waterfront permit — the added ribbon of land along the channel was just enough to push it over the edge. The expanded campus size emerged during a state Department of Environmental Protection hearing on Monday to discuss the company’s application for a license to build on filled tidelands. GE is developing the property with MassDevelopment, a quasi-public state agency. GE and MassDevelopment acquired most of the land for the project from P&G last month, paying $83 million for nearly 2.5 acres. MassDevelopment will own all the open space as well as two old brick buildings on the site. GE, meanwhile, will own the 12-story structure that it plans to build during the next two years, as well as the land underneath it. The new piece of land, essentially a part of the Harborwalk that extends south along the water, will also be owned by MassDevelopment. Peter Cavanaugh, ecosystem transformation leader at GE, walked through some of the public benefits and amenities that GE will provide in return for being allowed to build in the waterfront area. About 75 percent of the total ground floor space in the three-building campus will be open to the public. There will be a full-service restaurant, a coffee shop, a “learning lab” for high school students, and a GE-focused museum, or “experience center,” as Cavanaugh called it. A GE employee will oversee outdoor activities that take advantage of the space, such as kayak rentals, and the company will be responsible for maintaining open space areas. The property includes an existing dock, which will remain open to the public. Cavanaugh said the company recognized last year that it would need to offer public amenities to get the state’s waterfront permit. He said 68,000 square feet will be set aside for open space, but 15,000 square feet of that either will be under an overhang or a canopy, and thus can’t count toward the state’s 50-percent threshold. Cavanaugh said he hopes a decision on the waterfront permit will be made in April. With Governor Charlie Baker’s administration on board, it’s widely expected that GE and its partner, MassDevelopment, will get the license. At that point, GE will huddle with general contractor Suffolk Construction to refine the project’s construction timeline, Cavanaugh said. GE officials had hoped to move into the old brick buildings by early 2018, and into the new structure by the end of that year. But after Monday’s meeting, Cavanaugh was noncommittal about the move’s timing. “Our hope is that we’ll get in there as soon as we can,” he said. In the meantime, GE will continue to operate out of temporary space on nearby Farnsworth Street. The company moved its corporate headquarters to Fort Point from Fairfield, Conn., in August. MassDevelopment will own part of the campus because of an incentives package that state and city officials crafted to persuade GE to relocate to Boston. The Baker administration a year ago agreed to spend up to $120 million on property acquisition and improvements, and the state grant program that will be used requires that the property be publicly owned. Mayor Martin J. Walsh has also promised $25 million in property tax breaks, over the course of 20 years.